After some romance and medical fiction I was longing for some high adrenalin action read. 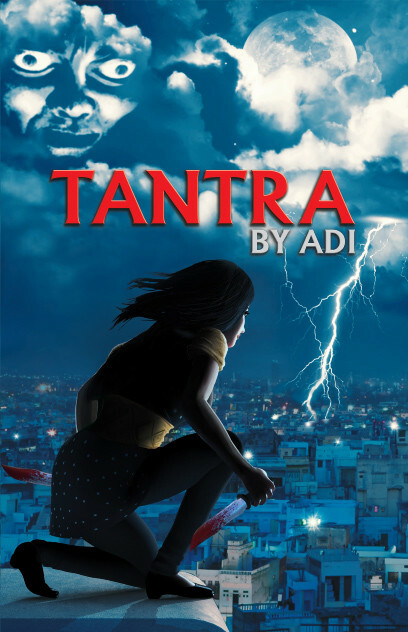 Just then Tantra by Adi landed in my hands. An Indian fantasy thriller is quite rare. So I was quite eager to read it. Fiction, thrillers are my favorite genres so kept reading it while travelling on bus, at lunch breaks, and I don’t remember where all. Anu Aggarwal the New York girl has quite an interesting job – she is a vampire hunter! Decked in her black leather outfit and carrying her ensemble of weapons she lurks around at nights to hunt down the blood sucking vampires. Anu moves to Delhi and joins Amit – a fellow guardian of Delhi (that’s what the world wide vampire hunting organization ‘the center calls their lead vampire hunters). Her Delhi sojourn has an underlying motive – to find and kill the vampire who killed Brian – her boyfriend in New York. However, after landing up in Delhi he realizes the situation in Delhi is grave and people are at threat from forces much more complicated than the vampires. She confronts Chandra, the leader of the ‘Vampire Panchayat’ (this is not how it is mentioned in the book – that’s what I am calling it) who comes across as a powerful & sensible vampire. With children going missing across Delhi Anu & Amit seek to go deeper in their investigation when they stumble across Baba Senaka – the evil tantric who desires infinite power. He sacrifices young children to accomplish his tantric feat. Will Anu be able to stop the evil tantric? How will she fight Senaka? Who will be the winner – the sattvic power or the tantric evil? You have to read Tantra to get these answers. As I mentioned earlier – fantasy thriller fiction is rare by Indian authors and Tantra is a good attempt at that. To the contrary Tantra is not the first vampire novel in India. Only other novel I have read on vampires set in India by an Indian author is The Company Red by Shantanu Dhar. I have reviewed that as well and you can read it here. I am not sure if there are others. Adi has quite nicely held onto the essence of Delhi – its street foods, market places, and autowallah’s antics (well that’s not limited to Delhi only – everywhere it’s the same story – Bangalore is just at the height of it I guess). The first few chapters are tad little slow with of descriptions and the age old story of seeking revenge. However, as you start reading further you get to read the faced paced drama, evil Senaka and as the protagonists say ‘Voodoo mubo jumbo’. The writing style is simple yet enthralling. However, I have to mention I didn’t understand what this ‘shift’ was. It felt as if the vampire hunters become vampire like. Only after several chapters will you get to know what this supernatural power/technique is. So it was confusing at the beginning. I would be dishonest if I said I never felt it was going the Underworld track. And when I say Underworld it’s not about the fight between Vampires and Lycans. The character of Anu resembles Kate Beckinsale’s character Selene in many ways – at least I felt that way. The description of Baba Senaka and his rituals, though good, brought an immediate visual in my mind – don’t know if anyone remembers Ashutosh Rana as Lajja Shankar in Sangharsh. He was very promising as this evil religious fanatic in the movie. And this is what I visualized with the detailed description of Baba Senaka. Well it could have been inspired from them as well and it’s good. I tried getting to know more about the author but could find only his FB page even with the domain name http://www.tantrabyadi.com – is that spooky or did he not create a website at all!! I don’t even know whether this is his pseudonym or real name. Though it promises to be a good thriller it gets slow at portions and picks up pace at other parts. I would have liked it even faster.